An Advanced Motion Adaptive Directional Deinterlacer removes the effects of artifacts introduced during the deinterlacing process. Motion adaptive deinterlacing is used in video processing to create a sequence of output frames at the same rate as the interlaced sequence of input fields. Deinterlacing can create visible feathering and scintillation effects. 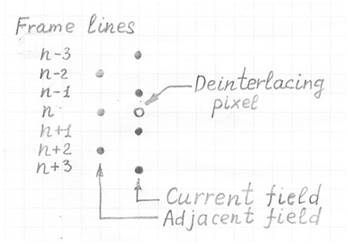 To reduce these artifacts, deinterlacing pixels (Figure 1) can be created as the weighted sum of the replicated pixels from the adjacent field and vertically interpolated pixels from the current field. Although both artifacts are reduced they are still quite visible. To reduce them even further, a third component to the weighted sum is introduced using a vertical high pass filter. Both “feathering” and scintillation artifacts are substantially reduced, but a new artifact is introduced – jaggedness. Since a vertical interpolator is utilized on the current field for nonzero motion, diagonal and nearly horizontal edges produce severe “jaggedness” artifacts. To reduce the artifacts, a directional interpolator instead of a vertical interpolator is used. The directional interpolator requires information about the direction (or angle) of edge or textures corresponding to the deinterlacing pixel area. This information is extracted from the current field of existing pixels by the direction detector.